After a rest day on April 24 in Windhoek, the capital of Namibia, the TDA bikers rode 2 days in a southwesterly direction to Sesriem. After a day of rest in Sesriem they rode 5 days south to Felix Unite safari camp on the Orange River bordering with South Africa. Total distance biked was approximately 996 km (147, 155, rest, 132, 151, 126, 110, and 175 km each day). Because this was a new route, I do not have daily elevations, other than Windhoek at 1707 masl and Felix Unite on the Orange River at 169 masl. While that indicates a lot of descent, there were numerous challenges ups over the seven riding days. The road traveled was gravel most of the way. They could have taken a paved road, but instead TDA selected a more challenging route. Riders described the route as both beautiful and taxing. The gravel roads were less packed than anticipated, sandier and more corrugated than desired – resulting in long days on the bicycle (or on the truck). The first day out of Windhoek the riders crossed the Tropic of Capricorn. They certainly have covered a lot of road since crossing the Tropic of Cancer way back in Egypt. The day coming into Sesriem started with a climb to over 1930 masl through Spreetshoogte Pass. As the riders reached the top of the pass, the ‘view opened out to reveal jaw dropping views over the Namib Desert.’ From there the track descended 0.5 km in 4 km, which required a steady grip on the brakes (at least for me it would have). Sesriem is not a town but a government run campground. On the rest day at Sesriem, many of the riders took a tour of the famed sand dunes, some measuring over 200 m in height. One rider commented on the variety of beetles whizzing around all over the sand and flies being aggravating while riding. Two days prior to Felix Unite the TDA riders camped near the Fish River and the world’s second largest canyon (behind the Grand Canyon in the USA). Not much written by TDA riders on people or agriculture. Food however was discussed: a German Bakery in Windhoek with ‘loads of cakes, pastries, cookies and coffee’; dinner in Windhoek at NICE, the Namibian Institute of Culinary Education, of hot chocolate, African salad, a club sandwich, and a strawberry milkshake; and a restaurant at Solitaire famous for their apple crumble and game burger. As of when I posted this blog, not all the TDA riders had updated their websites. Of their photos across this stretch only one showed cattle and one other showed fenced land. No cropland was photographed. The overall comment on the landscape was that it was ‘stunning’. 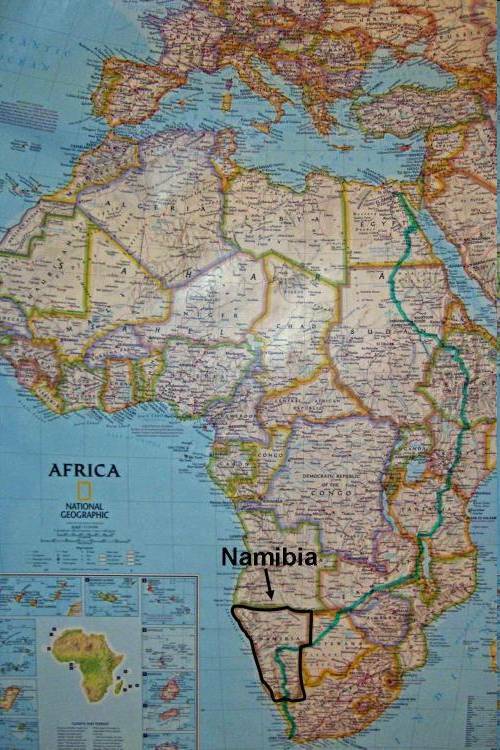 After a rest day on April 18 in Maun Botswana, the TDA bikers rode 5 days in a west southwesterly direction to Windhoek, the capital of Namibia. Total distance biked was approximately 830 km (157, 142, 207, 162 and 160 km each day). The road was straight, flat, and paved – and the riders have really increased their daily distance traveled. The 207 km ride on April 21 is the longest on this year’s tour. Elevation at Maun was 947 meters above sea level (masl) and the elevation at Windhoek was 1707 masl. Elevation each of the 5 nights was 982, 1140, 1273, 1459, 1707 masl. Although I said the road is flat, during these five days the riders have gained a significant amount in elevation. At Maun they skirted the Okavango Delta for a day, and then traveled across the northern portion of the Kalahari Desert. On April 21 they entered Namibia – their 9th country – at Manuno. The Okavango Delta is a vast delta formed from the Okavango River which originates in the highlands of central Angola. It is the world’s largest inland delta, and each year some 11 cubic kilometers of water reach the delta. The water from the delta is evaporated relatively rapidly by the high temperatures, leaving enormous quantities of salt behind. The water entering the delta is unusually pure, due to the lack of agriculture and industry (and people) along the Okavango River. The Kalahari Desert derives its name from the Tswana word Kgala, meaning “the great thirst”, or Khalagari, meaning “a waterless place”. It is a vast area (225,000 sq. mi.) 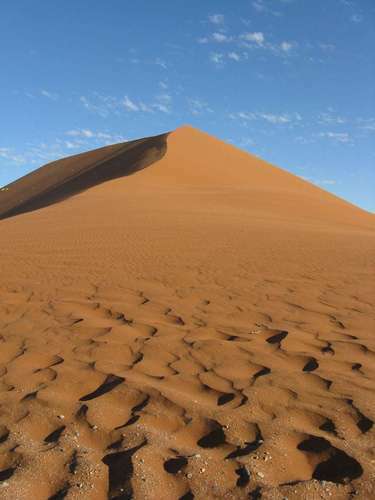 in portions of Botswana, Namibia and South Africa covered by red sand without any permanent surface water. The San people, or Bushmen, have lived in the Kalahari for 20,000 years as hunter-gatherers. That means they survive by hunting wild game with bows and arrows and gathering edible plants, such as berries, melons and nuts, as well as insects. Supposedly, Bushmen rarely drink water; they get most of their water requirements from plant roots and desert melons found on or under the desert floor. The San have their own characteristic language that includes clicking sounds. The riders didn’t see much agriculture or many people along this stretch. The riders spoke of the long, flat road, and that the wind came from every direction. After hot days in Botswana, it rained the night before arriving in Windhoek. That day the 4X4 broke down and had to be towed to camp. It was a bit of a hassle complicated further because it involved trips back and forth across the border and currency exchange (Pula in Botswana and Namibian dollar in Namibia). Speaking of currency, one rider commented she had gotten a 100 Trillion Zimbabwean dollar (ZWD) bill, ‘which is worth essentially nothing’. The Zimbabwe government redenominated the ZWD again in early at a rate of 1,000,000,000,000 old ZWD to 1 new ZWD and the rate is still 279 ZWD to 1 USD.